At PeachTree Place Assisted Living Community, mobility is never an issue that prevents our residents from enjoying each day to the fullest. We recognize the value of being involved in activities that keep things interesting, and how important it is to have a group of people with whom to share the experience. The Great Room is our spacious recreation room that allows all residents access to countless fun activities organized to suit a wide variety of tastes. 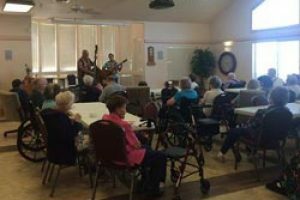 We know that remaining social and active is a vital element for the well-being of our seniors, and it is important to us that we continue to provide a fulfilling and supportive atmosphere in which to do that. PeachTree Place offers a variety of games to keep things interesting. We have Bingo, Wii Bowling, Canasta, Skunk, Blurt Game, and Resident’s Choice board games. Come join us for laughs and healthy competition. The Great Room has a stage that hosts entertainers and our weekly LDS church services on Sunday at 3:00 pm. When we are not enjoying being active outdoors, our residents benefit from organized exercise in the Great Room. Come participate in some of the other events appreciated by residents such as our writing group, crochet, and other craft classes, The Relief Society, book club and more. Check out our activities page and calendar for updated activity information. Even after the scheduled activities have ended, the Great Room is still there to enjoy. Feel free to enjoy an assortment of paper, pens, cards, dice and board games with other residents or visitors. All these items can be found in a cupboard towards the back of the room. Come be a part of our engaging atmosphere and supportive community. At PeachTree Place Assisted Living Community, we are known for our caring, unique atmosphere. We will make you feel like part of the family as soon as you walk through our doors. We’ve been helping provide an encouraging and comfortable community living experience in West Haven, Utah for ten years. Give PeachTree Place Assisted living Community a call today.